Die struck or casted lapel pins with two or three-dimensional designs. 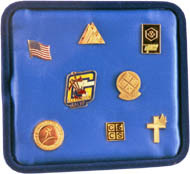 Pins are available in various sizes, shapes and finishings, with or without enamel. Pins can be struck in solid brass, bronze, silver or gold; or casted in white metal; and can be plated in nickel, silver, or gold. Enamelled pins can also have up to 5 different colours to better enhance your logo design. Contact us now for more information on how to have your own customized lapel pin made or for a price quote.